'Ar Ragfyr 12, lyfrgell Wrecsam oedd y lleoliad ar gyfer lansiad llyfr diweddaraf Grahame Davies, sef Real Wrexham, un o'r gyfres 'Real' o wasg Seren. Llyfr yn y genre seico-ddaearyddol ydy hwn, lle mae'r awdur yn cymryd golwg bersonol iawn ar ardal arbennig. "Wrexham: the Eastern Front of Wales. The place where the tide of Saxon invasion rolled in, hit the mountains and stopped. The place where Owain Glyndwr came to get married, where Elihu Yale came to be buried, and where the giants of English football came to be killed. This is a border town where landscapes, accents and identities meet, mingle and merge. A place where mountain meets plain, Wales meets England, and the Mabinogion meets Man U. "The biggest town in north Wales gets the Real treatment from novelist and poet Grahame Davies. Born in Coedpoeth, now much-travelled, he's still fascinated by his hometown. Mixing personal experience and memory with history, topography, journalism, and an unflagging interest, Davies looks beyond Wrexham's workaday image and finds something rather special. "Real Wrexham's real-life characters include obsessive football fans, an ill-fated racing driver, a soccer-player-turned-TV-psychic, several hard-drinking priests, two high-society lesbians and a werewolf. Among the subjects it features are a mysterious massacre, a mining disaster, a tour of Wrexham's 'Wild West' and a guide to 'Parallel Wrexhams' worldwide. 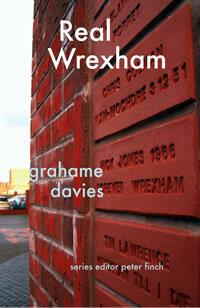 If you thought you knew Wrexham, this book will make you think again." Ceir adolygiad ar flog Gogledd Ddwyrain Cymru y BBC yma. A cheir adolygiad ar safle Anthony Brockway Babylon Wales, 'Notes from the margins of Welsh popular culture' yma A cheir un ar wefan y nofelydd Clare Dudman: yma. Meddai am un o'r darnau agoriadol: "Sometimes I read something and it seems to be so 'right' it is beautiful - and that is how this short passage seems to me."